Chinese believed that we have to constantly provide adequate nutrition and cleanse our body. This is especially so when the weather was cold and the body’s immunity and resistance are week. Therefore, according to Traditional Chinese Medicine (TCM), herbs and tonics are required to maintain our body in top notch condition to fight against any disease. 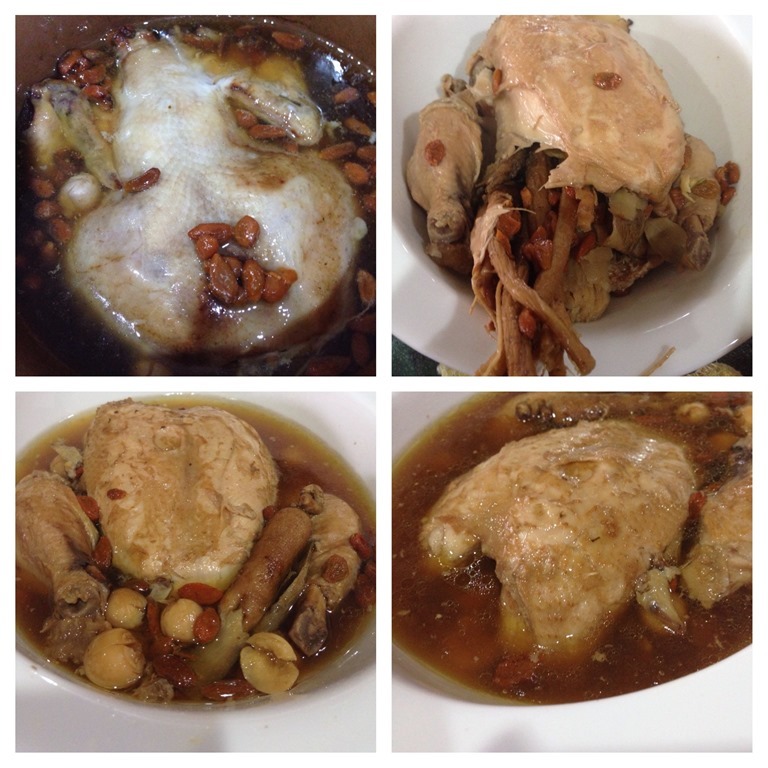 I am no expert in TCM and I will not simply ask any readers to cook Chinese herbal soup based on my own recipe. Chinese usually go to the medical hall (stores) or medicine practitioners to get the relevant herbs mix for the preparation of herbal soup. However, nowadays, there are ready herbal mix in the supermarket and we usually bought this ready herbal mix based on the instructions and explanations stated in the package. Last week, I bought a ready herbal mix package from a supermarket in Singapore. 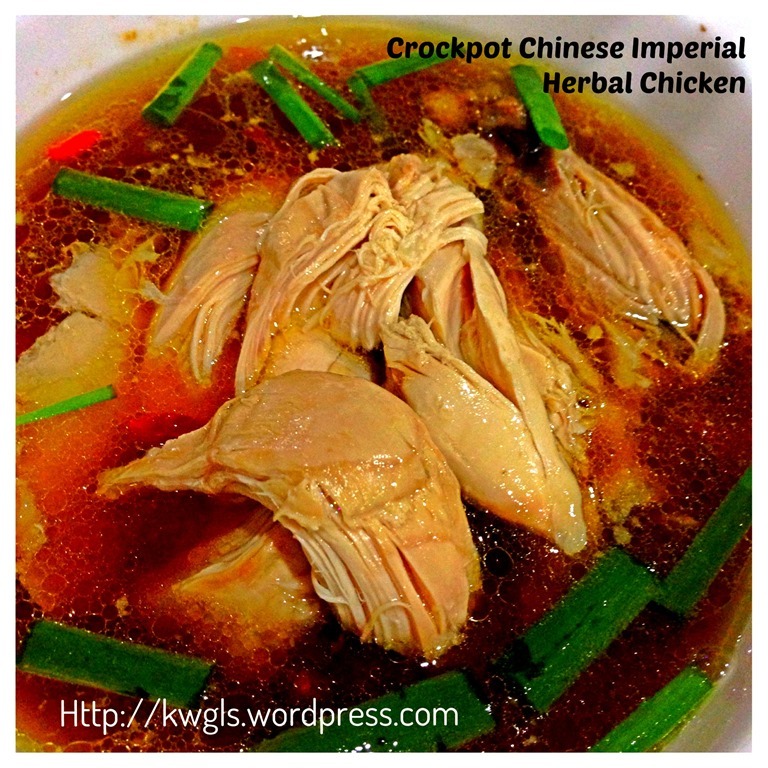 It claims to be the chicken herbal mix for the imperial family.I have prepared the soup using a crockpot or Asian slow cooker. 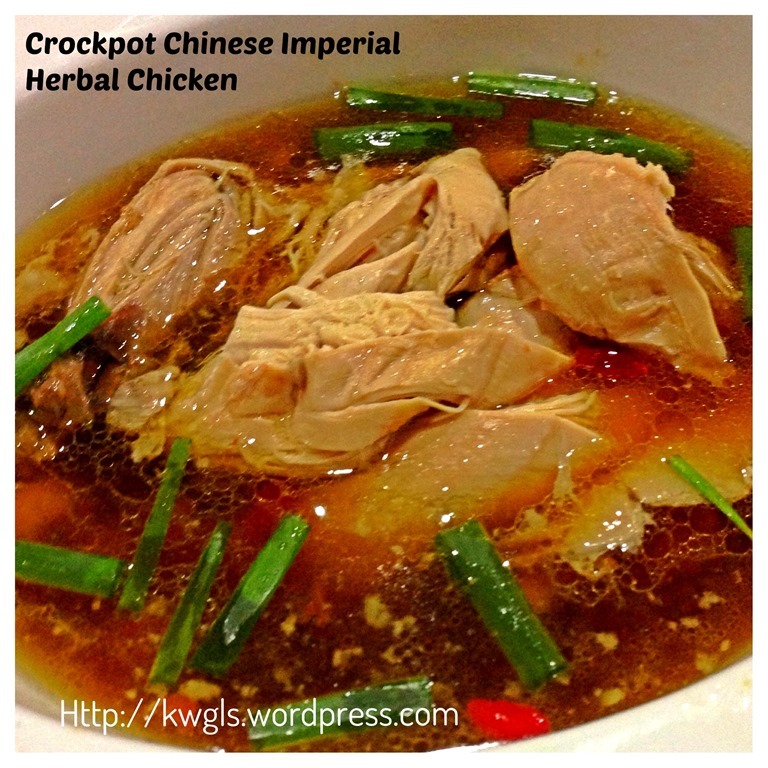 I put all in the slow cooker, went out for my weekly marketing and when I am back for dinner, the herbal soup is ready. Sensing that some international readers may not be able that get the ready mix herbal package, therefore, I have listed out the ingredients and for those readers who are interested, they can just provide the recipe (herbal mix) to the traditional Chinese medicine stores and they will be able to get ready all these dried herbs. 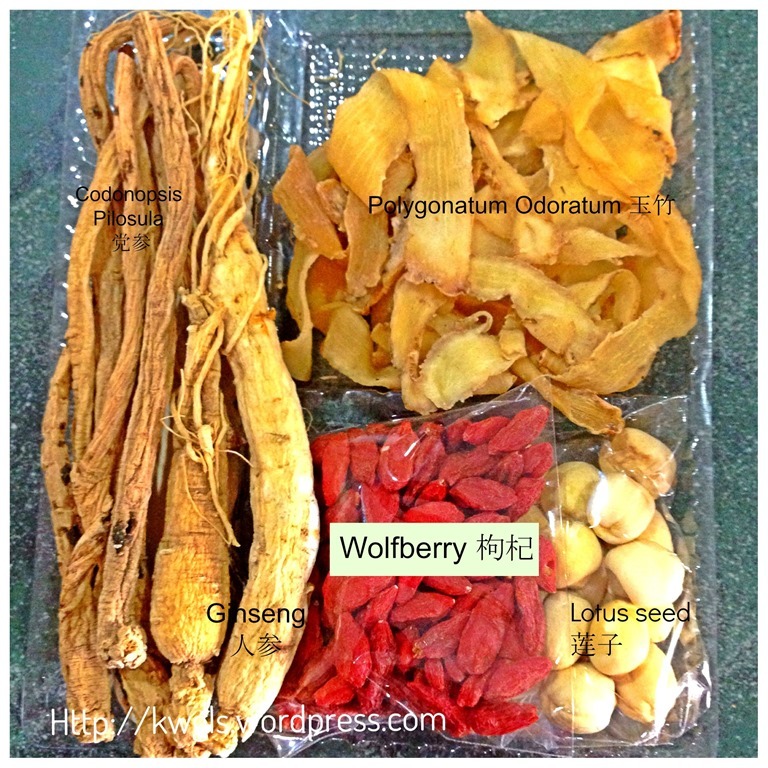 In my humble opinion, not all ingredients are necessary and it can be as simple as just one or two common herbs such as ginseng and wolfberry bypassing the use of other exotic herbs. Wash the chicken thoroughly, take out any hairs and chopped off head and legs. 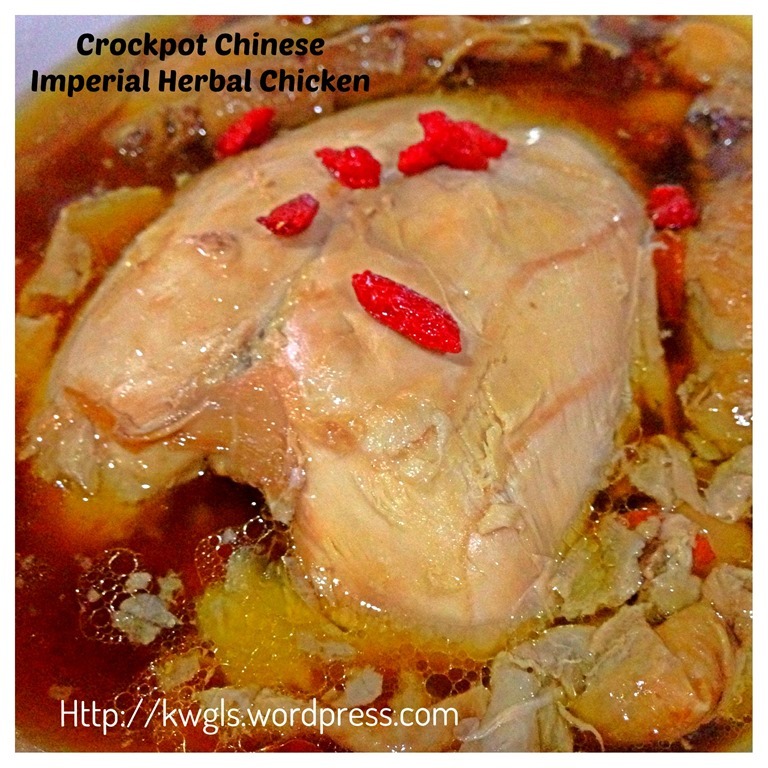 Stuff all the herbs inside the body and place it in a slow cooker or crockpot. Put in water to cover about 75% of the chicken body. Use the slow cooker or crockpot to cook for at least 2-3 hours. 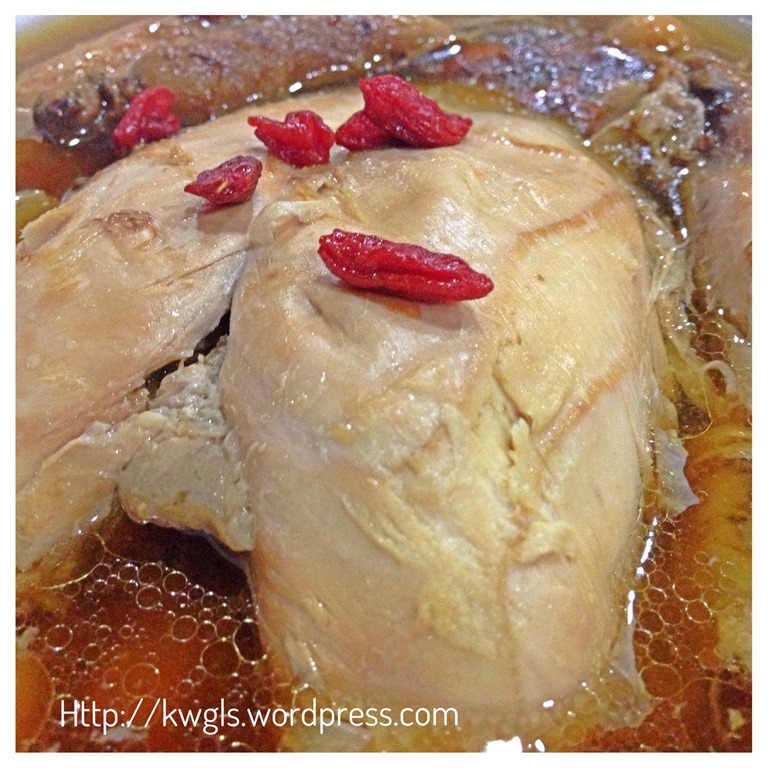 The chicken meat should be very soft and tender at the end of slow cooking. I have selected the auto mode for this illustration. Instead of stuffing the herbs inside the the chicken body, you can use a herbs cloth bag and put it in the crockpot. Should you feel that the soup is too greasy, you can let the soup cool, put it in the fridge, let the fats solidify and reheat the soup before serving. Best served hot with white rice. Note that Chinese herbal chicken shall not have add any seasonings (including salts) and when serving, no condiment were given too. However, if you feel that it is too bland for your liking, we will eat it with some dark soya sauce. Chinese believes that Autumn is the right time to nourish you and prepare your body to overcome the cold winter. 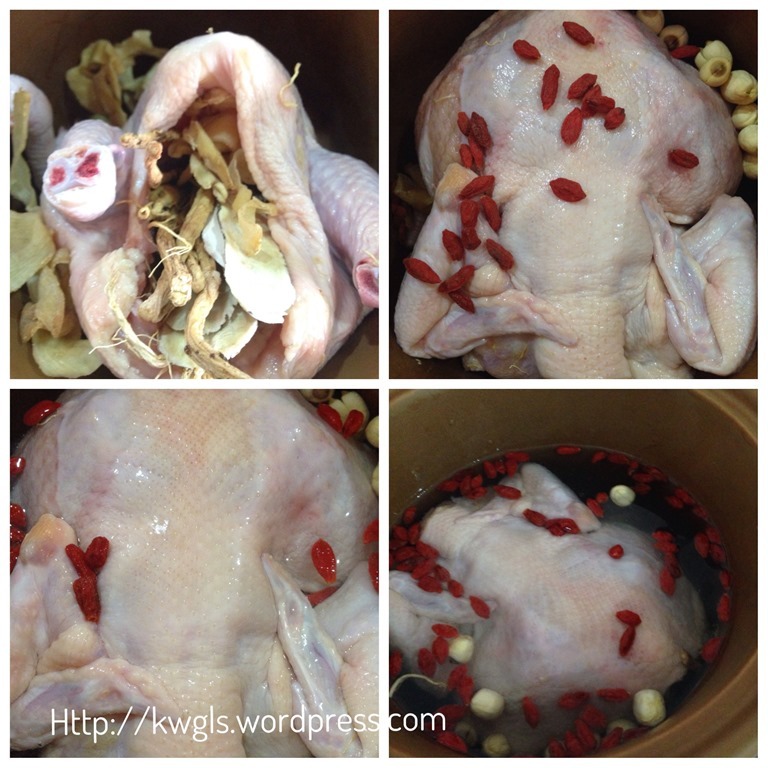 Why not try to prepare this herbal chicken for your family. However, it should be noted that it is best to consult a traditional Chinese medicine practitioner to get the right herbs mix. 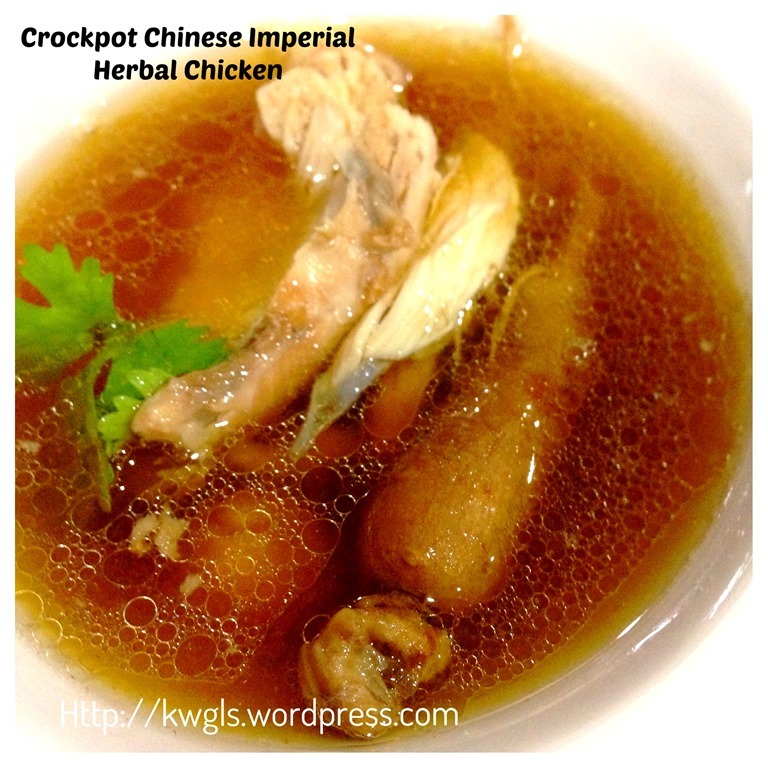 If you have difficult to get the right herbs, just ginseng and wolfberry shall be sufficient for this tasty soup. Hope you like this post today. Cheers and have a nice day. 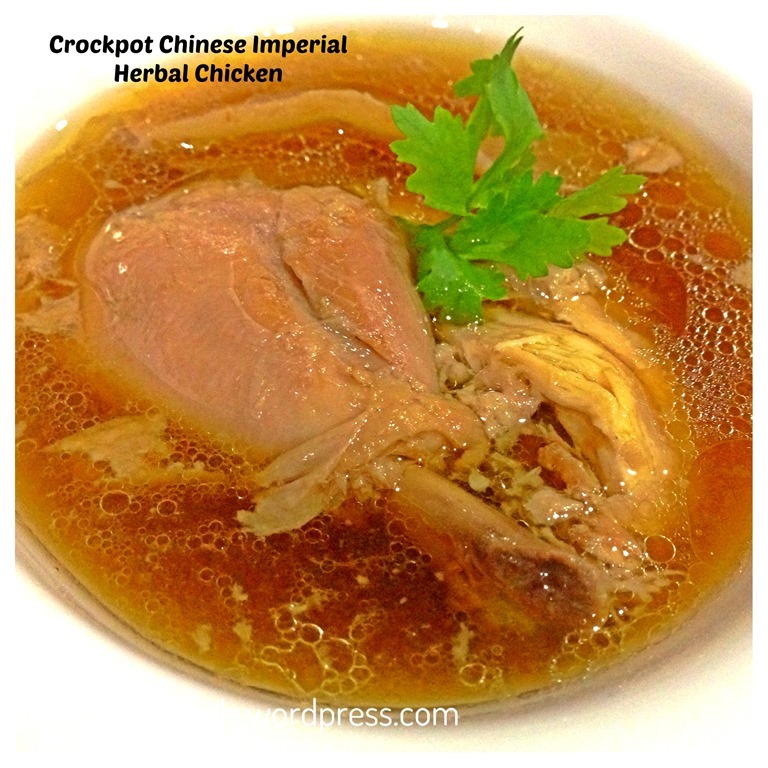 This entry was posted in Dish, Food Preparation Series, Soup and tagged 8, Chinese Imperial Herbal Chicken, crock pot recipes, Crockpot Imperial Herbal Chicken, Ginseng Chicken, Guaishushu, Imperial Herbal Chicken, postaday, Slow cooker recipes. Bookmark the permalink. I love making different soups and this one looks good. That’s really fascinating! I’d say that here in America, for the most part, we don’t eat for our health–not like this! People might eat “healthy” food, but not something so full of good herbs. And it looks delicious! 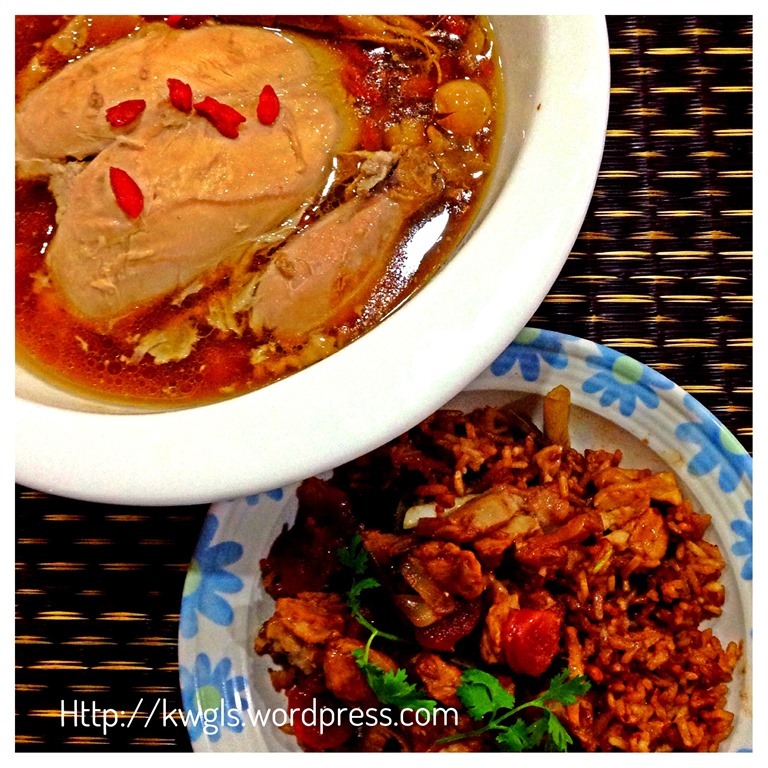 Thank you so much for sharing all of your great recipes on the Daily Blog Boost! I love that when I read your blog, I don’t just find a great recipe, I learn something too. Great insight into herb choices and health. This sounds so delicious, Kenneth! Since the weather is starting to cool off on our side of the world, this is perfect 🙂 Thanks so much for linking up to Freedom Fridays!